Coastal Crusing - 5 Day course. The objective of CPC 2000 is to teach students the skills necessary to expand their boating horizons confidently and safely. Whether it’s for a short weekend trip or an extended cruise, students learn how to properly prepare for a voyage into unfamiliar waters on a twin inboard power vessel. With skills learned in CPC 1000 as a building block, the Coastal Cruising curriculum teaches critical cruising elements including piloting and chart navigation, Electronic charting and Radar, running inlets and handling common emergencies underway. Students are then given the opportunity to put their newly learned skills to the test with specially structured underway exercises aboard one of Chapman School's training vessels. The program includes approximately 16 hours of "hands-on" training simulating the types of real world situations encountered while underway. 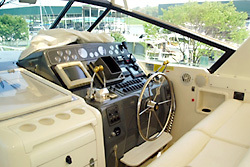 This course is specifically deigned for serious boaters who want to increase their cruising skills in a fun, practical and hands on learning environment. Each class is taught by U.S. Coast Guard licensed, professional instructors through Chapman School’s unique "Learn at the Helm” approach. Class size, on board, is limited to five students to maximize individual attention and instruction while underway. CPC 2000 provides the foundation for the more advanced curricula found in the CPC 3000 and CPC 4000 certification levels. Inland and Coastal Chart Navigation (9 hours) - Includes Inland piloting techniques, ATON's Rules of the Road, offshore Position determination, Tides & Current planning. Voyage Planning (8 hours) - Chart selection and route planning analysis, watch standing & responsibilities, provisioning and fuel requirements, using electronic navigation tools, Radar and weather reporting sources. Voyage Execution & Cruising Skills (16 hours underway) - Pre-departure procedures, transiting inlets, use of charts and electronic navigation equipment en route, monitoring essential vessel systems, docking and undocking procedures,MOB recovery, transiting bridges and marina considerations. Persons attending the 5 day program must be at least 18 years of age and in good health, submit a properly completed and signed Registration Form and have an official photo ID on the first day of class. Students between the ages of 15 & 18 may take this program if accompanied by a parent or guardian. Successful completion of CPC 1000 is required. This program also requires a minimum of three students. All students who successfully complete the program will be awarded a "Certificate of Completion” from the Chapman School of Seamanship. 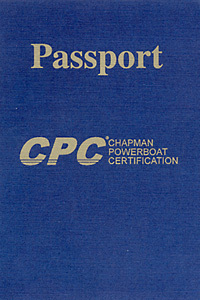 CPC 2000 certification will be awarded to students who pass the written CPC exam and boat handling skills test given at the conclusion of the program.